Following the wise course charted by Alaska, Florida, Kentucky, Massachusetts, New York, Oregon, Pennsylvania, and Washington, the Illinois State Board of Elections today voted unanimously to withdraw from the ineffective and insecure Interstate Voter Registration Crosscheck program run by the State of Kansas. 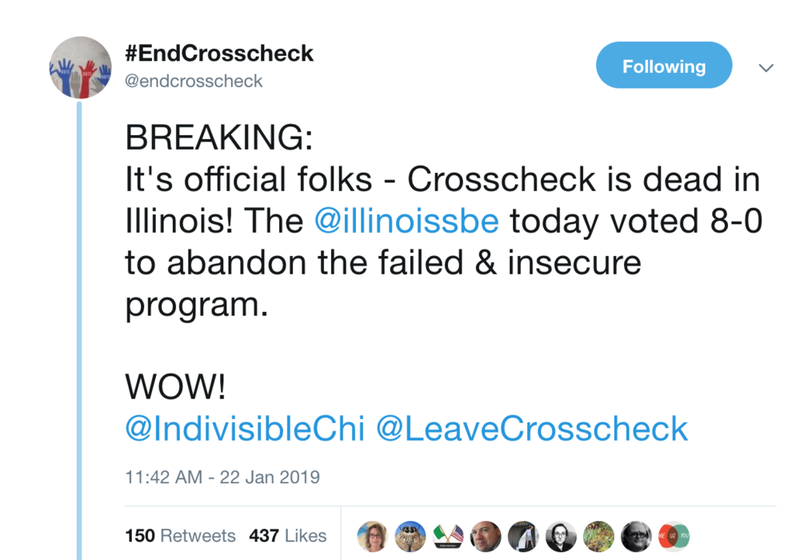 Today’s vote means that 26% (9 of 34) of states that ever tried Crosscheck have formally withdrawn from participation due to issues ranging from dreadful data security and resource waste due to weak data matching standards. Another seven states publicly admit to exhaustive processing to remove the copious false positives before doing list maintenance with the results. Altogether that’s 65% of states with Crosscheck who have said “Thanks, but no thanks” to Crosscheck’s output in one form or another. Crosscheck wasn’t a bad idea. It was a good idea, badly executed and left behind by neglect and inept management. 2005 data security and back-of-the-napkin data matching have no business affecting voting rights for 100 million Americans. If you’re a Kansan, there is an additional concern: if this massive database is breached, hacked or mishandled in any way, we Kansas taxpayers are on the hook to make it right. That financial hit could devastate Kansas. Crosscheck didn’t run in 2018 because the massive data security risk was publicly exposed. Kansas Secretary of State Schwab now faces the decision: reanimate the program, or move on to ERIC. It is time for Kansas to shut down Crosscheck and join ERIC. Newer PostBREAKING: Colorado quits Crosscheck.